Having been churning out the written word with Worm Gear since 1995, I’ve had the opportunity to drift with the rise and fall of different geographical metal scenes that have risen up to points of over-saturation and annoyance, only to burn themselves out and retreat. In the mid 90’s, NY style brutal death metal was the hot item. Oh man what a tough one that was to endure. Swedish melodic death and eventual black metal soon followed suit, with every band from Sweden sounding as if they had suckled at the teets of Thomas Lindburg and the At The Gates crew. This was a sound that burt out for me really quick as there was nothing really new under the sun, especially if the band bragged about their Gothenburg affiliation, or even relocated there to be under the microscope of greedy and non discerning record labels. Through it all, there was a deeper and more noteworthy scene burrowing beneath the surface of the Swedish explosion that possessed more of an impressive fire for the dark arts. Bands like Sacramentum (early), Nifelheim (gods! ), Runemagik and the like all centered their efforts on melodic, heavy, intense, and conviction bloated musical praise for the dark lord. Some of these bands faded into obscurity, while others continue on to spread their excellent unholy seed. While Necrocurse have been pushing out EPs (3 of them) since 2011, they have finally focused their energy and unearthed their debut full-length, Grip of the Dead”. Featuring members Nicklas Rudolfsson (Sacramentum, Runemagick, Deathwitch, Swordmaster and a long list of others), Johan Backman (Runemagick), Stefan Rodin (Masticator), Martin Andersson, and the blazing vocal prowess of Nifelheim’s Hellbutcher, Necrocurse is a thriving entity of thrashing black purity and sonic torture sure to take the listener back in time to more exciting and influential times in regards to underground metal. 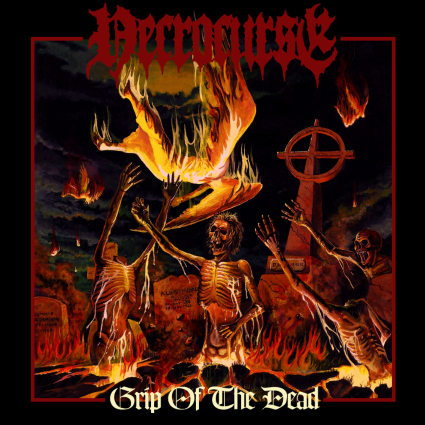 Necrocurse in many ways have surpassed the greatness of the bands where each of these individuals came from due to the cautious modernization and relevance of the material on this album, while NEVER letting go of the ancient evil metal spirit. Grip of the Dead is a hungry beast that unleashes hell as the opening moments and riffs of “Prelude of Devastation” instantly attack the senses with a buzzsaw-like ferocity and guitar work that ignites with inferno hell-riffage and memorable songwriting. At times the blunt delivery puts me in mind of Nicklas’ old project band Deathwitch due to the simplistic, though undeniably effective hooks, but Necrocurse offers far more in the realm of melody with searing harmonies that never sound weak. Imagine if Smith and Murray decided to join Bathory and add their influence (sans solos) to the first 3 albums for a twisted pipe dream that is nearly a reality with the birth of Necrocurse. The simplistic segments of sound layer perfectly together in this material so that the music sounds authentic, advanced, pure, and so striking with the energetic push of a D-beat and a seemingly endless array of tempo choices to keep the material moving deftly into the fires of the end. The teeth grinding blast of the title track intro really stokes an aggression you can feel in your chest. Hellbutcher’s caustic and coherent vocal scars are icing on this infernal cake as his over the top screams never let up the attack and add even more of an old school Bathory charm to exist within this excellent album. ~ by martyworm on March 6, 2013. This entry was posted on March 6, 2013 at 7:53 pm and is filed under ALL REVIEWS, N-reviews.You can follow any responses to this entry through the RSS 2.0 feed.You can leave a response, or trackback from your own site.